Tuesday, Dec 4th was #NationalCookieDay. Did you make and/or eat any cookies?! Here are a few of our family favorite Cookie Exchange Recipes. They are yummy! Read “Sharing Our Family’s Fun Holiday Traditions” blog post to learn more about our cookie exchange. Try out the recipes and let us know what you think (leave a comment below). 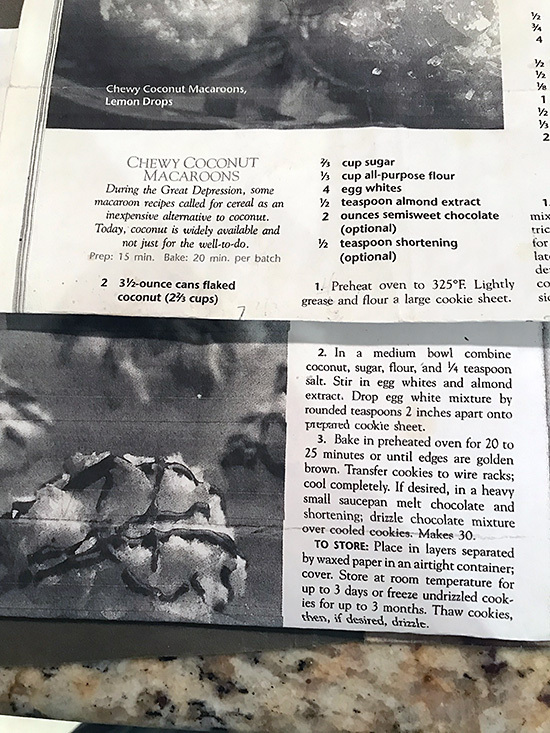 During the Great Depression, some macaroon recipes called for cereal as an inexpensive alternative to coconut. Today, coconut is widely available and not just for the well-to-do. 1. Preheat oven to 325°F. Lightly grease and flour a large cookie sheet. 2. In a medium bowl combine coconut, sugar, flour, and ¼ teaspoon salt. Stir in egg whites and almond extract. Drop egg white mixture by rounded teaspoons 2 inches apart onton prepared cookie sheet. 3. Bake in preheated over for 20 to 25 minutes or until edges are golden brown. Transfer cookies to wire racks; cool completely. If desired, in a heavy small saucepan melt chocoloate and shortening; drizzle chocolate mixture over cooled cookies. To store: Place in layers separated by waxed paper in an airtight container; cover. Store at room temperature for up to 3 days or freeze undrizzled cookies for up to 3 months. Thaw cookies, then, if desired, drizzle. Roughly makes 24 balls, depending on the size. 1. Preheat oven to 400°F. Mix butter/margarine, sugar & vanilla. Add the remaining ingredients. Mix until holds shape. 2. Roll into 1” balls. Place on an ungreased cookie sheet 1” apart. 3. Bake 10-12 minutes or until bottoms are slightly browned. 4. Take out of oven and roll in powdered sugar while still warm. 5. Let cool. Then roll in powdered sugar again. Some best-loved holiday sweets come from the personal recipe collections of Better Homes and Gardens food editors. This bar came from an editor’s Norwegian grandmother. 1. Preheat oven to 325°F. Stir together flour, baking powder, and ¼ teaspoon salt; set aside. Beat butter with an electric mixer on medium to high speed for 30 seconds. Add sugar; beat until combined. Beat in egg and almond extract. Add flour mixture; beat until combined. 2. Divide dough into four equal portions. Form each portion into a 12-inch-long roll. Place two rolls 4 to 5 inches apart on an ungreased cookie sheet. Using your hands, flatten each roll until it is 3 inches wide. Repeat with remaining rolls on another cookie sheet. Brush flattened rolls with milk and sprinkle with almonds. Bake one sheet at a time in preheated oven for 12 to 15 minutes or until edges are lightly browned. While still warm, slice diagonally into 1-inch-wide pieces. Transfer to wire racks; cool. Drizzle with Almond Icing. Makes 48. Almond Icing: In a small mixing bowl stir together 1 cup shifted powdered sugar, ¼ teaspoon almond extract, and enough milk (3 to 4 teaspoons) to make an icing of drizzling consistency. To store: Place in layers separated by waxed paper in an airtight container; cover. Store at room temperature for up to 3 days or freeze undecorated cookies for up to 3 months. Thaw cookies, then drizzle. We want to see how you celebrate with your family and friends – so be sure to tag @lifeoncelloff and show us all your fun holiday traditions for a chance to be featured on our page! Use of any product name/association is for editorial and educational purposes only. Shop with a purpose! A percentage of all proceeds from our Featured Lo.Co Tee will benefit Hope for the Day - please visit https://www.hftd.org to learn more about the cause.